Each Wednesday, sixth formers, who are paired with a number of Year 7 and year 8 students, meet at 3pm in the library for the TBSHS Paired Reading Scheme. The scheme runs from November up until the May half-term. Every 30 minute session the year 7 or 8 student reads out loud to their sixth form partner. The sixth form student then asks them a range of questions, supports their reading, helps with any words they don’t understand and encourages them through any difficult sections. 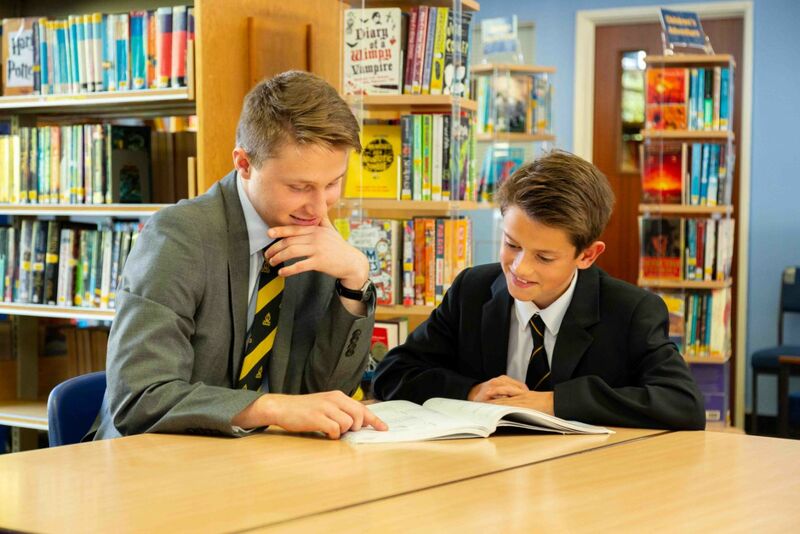 Across the academic year, this allows the sixth form student to help improve the Year 7 & 8s reading skills and build up a supportive, caring and advisory relationship with 'their' student. The Scheme is now an integral part of the Literacy programme we offer to students in Years 7 and 8. The Year 7 & 8s build a firm relationship with their Sixth former and usually grow in confidence as well as ability. The Scheme allows the younger student to practice reading aloud, which is a skill not all students are comfortable doing. The Sixth formers are all volunteers, and here at TBSHS we have found the scheme is beneficial for both age groups. The 6th Formers can add this work to a Personal Statement or CV. It is great work experience for students who may be considering going on to a career in teaching or working with young people. The Paired Numeracy Scheme is very new to TBSHS. Like the Paired Reading Scheme, 6th Formers are paired with a student from either Year 7 or Year 8. The students work through a booklet which has been put together by our Maths department. The Scheme is an ideal opportunity for younger students to embed their basic numeracy skills. Having 1:1 Maths tuition from A level mathematicians is an excellent way for younger students to improve their Maths. The Year 7 & 8s build a good working relationship with their Sixth former which helps their general confidence. The Scheme allows the younger student to practice their Maths skills in a relaxed and comfortable environment. Every Thursday during Tutor time, a number of Sixth Form students meet individually with a Year 7 or Year 8 student. The Sixth Form students receive in-house training so that they are able to mentor the younger students. The meetings take place in the 6th Form Centre and runs from November up until the May half-term. The Scheme is now an integral addition to the Pastoral support we offer our students. The Sixth Formers offer the younger students the opportunity to share common concerns around school including organisation and homework issues. The Scheme empowers the younger students by way of offering various practical strategies which has an impact on overall self-esteem and confidence. The Sixth Formers are al volunteers and they often report that they learn something more about themselves – a perfect win/win situation! The 6th Formers can add this work to a Personal Statement or CV. It is great work experience for students who may be considering going on to a career in teaching or working with young people.